Simple clean lines with distinct functionality and a touch of whimsy suggesting a flower in a garden. 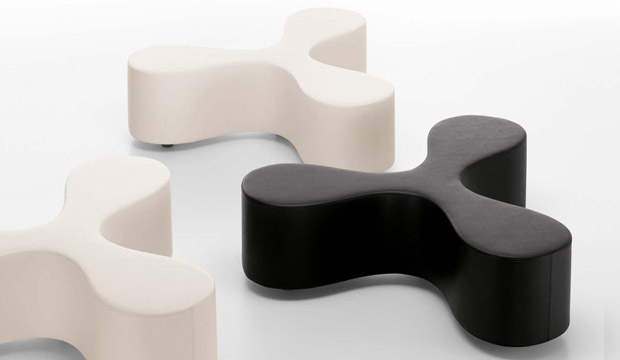 Flower is a bench with a slender middle and a petal-shaped seat design reminiscent of a clover or a three-leaf blossom. It is a comfortable seating solution for up to three people who want to communicate with one another or who are seated facing away from each other, relaxing alone. Design work on Flower began in 2001 and was first employed during the 7th Istanbul Biennial. Since then, the bench has been produced repeatedly in small numbers for individual projects, making it clear to SANAA and Vitra that Flower was ready to be developed for larger scale production. Kazuyo Sejima (*1956) and Ryue Nishizawa (*1966) founded the SANAA architecture office in 1995. Awarded the Hyatt Foundation‘ s Pritzker Architecture Prize in 2010, the Japanese architects are currently designing a production hall on the Vitra Campus in Weil am Rhein.